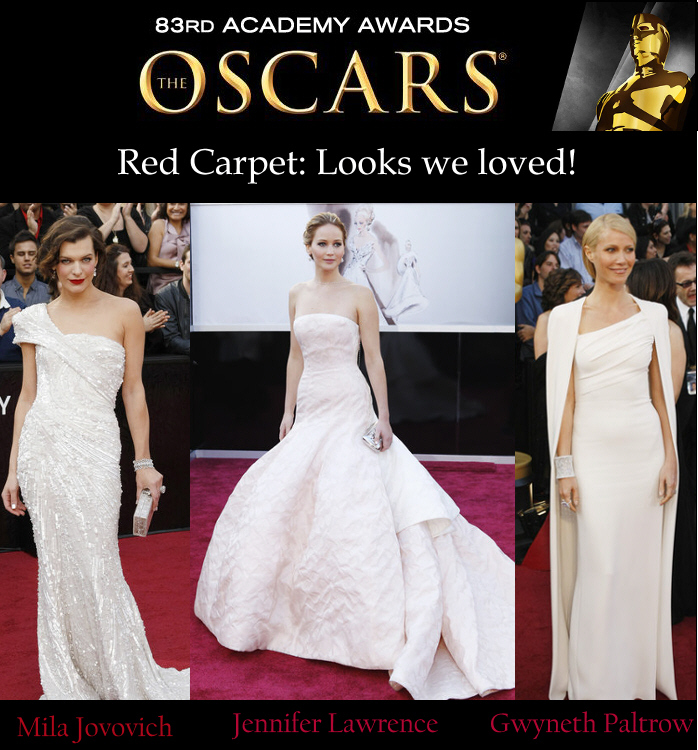 There was a lot of talent on the red carpet during this years Oscars! We were surprised by the amount of "worthy" movies this year, which is not always the case, season to season. A movie to see if you haven't already is Silver Linings Play Book. This movie has something for everyone, please, do not rule this as a chick flick because it is far more than that! We think Jennifer Lawrence looked beautiful, we congratulate her on her 2013 award and we commend her on her make up and over all look! She is beautiful, by nature, and her rose tone shades looked great. We have been seeing this "romantic" look beginning to trickle into this Springs trends. The use of light colors brings out the natural beauty in fabrics and on your face! In this case, Jennifer wore very natural looking make up, for an understated, yet angelic appearance. We love the asymmetric lines of Gwyneth's one shoulder draped dress. This classic and chic look never goes out of style, she owned this dress! White can sometimes be a tricky color to wear, because often it is see through, but obviously this leading lady has the body and the curves to make any outfit look stunning. Mila's dress was tapered to perfection. We love those dresses you can put on, and they are instantly flattering. If you notice how her dress is folded across her body, it slims her already TINY waist line and brings your eyes across her dress from head to toe. This year we have seen a lot of one shouldered dresses. We know that wearing a dress that reveals a lot of skin means you have to take care of your skin. We offer a great Lipo Conquer Toning cream by Dermelect, to help tone your skin in problem areas, this cream also helps with sag in your under arms, love handles and thighs. You can replicate this simple and clean look through understanding your skin tone. Colors like peach, have tendency of looking good on everyone, when applied correctly. Duwop offers just that, a perfect and even textured blush, for all day wear! Regardless of the trends, it's important to let your natural beauty shine through, never hide it! Embrace wearing the clothes you love, and it's never too late to change your make up style, if you don't like what you are currently doing. We know that change is difficult, but you live once, it's time to experiment and try to new things!